What a great experience we all had at Rita Ranch Storage, Car & Dog Wash. Our girls were responsible to each sell ten $5.00 tickets for the car wash, then they were required to come out from 1:00 to 4:00 to help wash cars. We were so busy washing cars that your staff opened up a third bay for our girls. I was able to talk to a LOT of parents/drivers. I was asked several times how much you (Rita Ranch Car Wash) was charging us to use the facility. It was with great pride that I would respond, “not a dime” they are doing a give back…a give back to our community and schools. I just wanted you to know how much we truly appreciated your HUGE generosity. The girls all had a blast while they were working hard to earn money for new soccer gear. Thanks again for EVERYTHING!!! 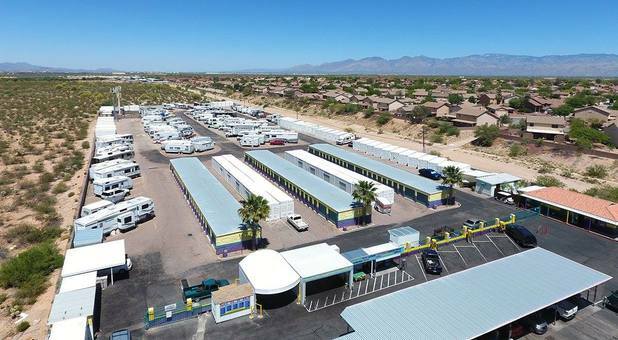 We store our RV and rent an 8 by 20 steel container at the Rita Ranch Storage facility. The containers are all cool coated which really reduces heat buildup in the summer. We also love the fact that we can park more than one vehicle at a time in our single RV stall. The staff really go out of their way to make us feel like family. Oh yes, we love the self serve dog wash and the free car and dog wash vouchers we get each month.